JUST like how a cowboy would roam the wild wild west on his trusty steed, Teo Yeow Soon did just that in his S$3,000 pickup truck in the late 1980s, busting his chops working on small-time paint jobs. After all, that was pretty much the skills that the then 25-year-old picked up from his younger days of helping out his uncle with odd jobs. Unknown to Mr Teo, he was layering his success coat by coat working under paint manufacturers including Nippon Paints and the former ICI Paints. From a one-man show handling what was described as "some painting of buildings", Vigcon Construction was incorporated in 1990 and has continued to grow since. In 1996, Mr Teo's older brother, Teo Tiow Guan, left his engineering job to help out at the company and the rest, as they say, is history. 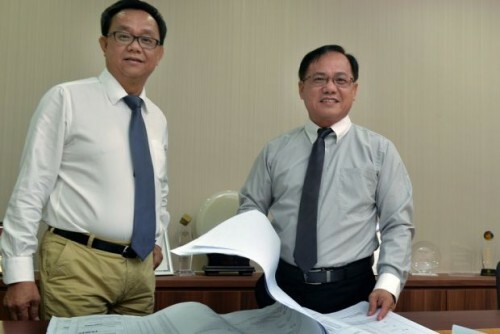 Fast-forward 18 years, the younger Mr Teo, 51, is now the managing director of Vigcon Construction while the older Mr Teo, 52, is its executive director. Together, the two bespectacled brothers now oversee about 230 staff, running a company that recorded a S$90 million turnover in 2013. Seated side by side with his brother at a long boardroom table on the day of the interview, Mr Teo Tiow Guan recounted the events shortly after he joined his brother. In 1998, the government introduced a man-year entitlements (MYE) policy which companies employing workers from non-traditional source (NTS) countries and from China for construction projects must adhere to. MYE reflects the total quota of foreign construction workers allocated to a main contractor for a specific construction project. Based on the value of projects/contracts awarded by developers/owners, main contractors are allocated a number of man-years required to complete a project, and also a number of foreign workers that it is entitled to employ. "At that time as sub-contractors, we were relying heavily on main contractors to issue us this man-year entitlement. We were having difficulty getting sufficient MYE because painting work is very labour intensive," explained Mr Teo Tiow Guan, who added that about 70 per cent of revenue is allocated to labour while the remaining go towards material. That got the brothers thinking about branching out as a main collector of wood and subsequently, the company tendered for government projects. Vigcon's construction business took off and is now one of its core pillars, along with the company's additions and alteration (A&A) arm. A&A currently contributes more than 50 per cent of Vigcon's revenue. The business is going from strength to strength, providing the company with "a substantial amount of work" as shopping malls need upgrading works every 10 to 15 years. Other sources of work include hotels, flats and home improvement programmes. The past five or six years have been an "eventful" one for the brothers, who said that the company had attained an average growth rate of about 20 per cent per year. But they anticipate a slowdown in the construction sector in the next two to three years as the government had announced that it will launch 16,000 build-to-order units instead of the previous 25,000 units. While the company may be affected, the brothers said that Vigcon should be able to maintain the same turnover of about S$90 million in the next two years. One way to do so is to improve productivity, which is what the government has been advocating in recent times given that the labour crunch is squeezing businesses, particularly the construction sector. The silver lining: The labour crunch is not likely to have a major impact on Vigcon as it hires locals. Recognising the importance of upgrading workers' skills, the company regularly sends staff for core trade training, which probably helps it to adjust to government policies with more ease. At the end of October, the government announced plans to raise the quality of foreign workers, starting with the construction sector. From Jan 1, 2017, at least one in 10 work permit workers on construction companies' payrolls must be higher-skilled R1 workers. A company that fails to meet this requirement would not be permitted to hire new basic-skilled R2 work permit holders for up to 12 months, according to the Building and Construction Authority (BCA) and the Ministry of Manpower (MOM). Construction firms with at least 15 per cent R1 work permit workers will be exempted from the new measure. The government will also let construction firms upgrade experienced foreign construction workers to R1 status, or hire R1 workers directly from overseas. This will take effect from Sept 1, 2015. Vigcon currently has about 12 per cent of work permit holders who are already under the R1 category, and said that it will work towards meeting the 15 per cent in the next three to six months' time. Even as the company described the government move as positive, it noted that the workers' turnover within the industry might drive wages to increase and that this will lead to higher business costs and ultimately, a rise in construction costs. On their part, the Teos have introduced ways to raise productivity and reduce reliance on manpower, although they said that workers cannot be totally replaced. "In the project sites when you do excavation, when the vehicle comes in, it'll be full of mud at the wheels, so we cannot allow them to just go out and dirty the roads," said Mr Teo Tiow Guan. The conventional method takes two workers about 10 minutes to hose off the mud, but that manpower is no longer required as the vehicle now drives through a recently-purchased automated drive-through wheel washer. Other initiatives include thumbprint identification linked to the payroll department to register the attendance of the workers, facilitating easier calculation of workers' pay, and GPS trackers to facilitate deployment of vehicles to worksites. Besides technology, close supervision also helps to increase productivity as it reduces the margin for error and in the same vein, any rework. The brothers said that they do not expect more than 3-5 per cent of rework in general, as the construction margin is low and these few percentage points differentiate the level of competitiveness between Vigcon and the others. "The top management is very involved in a project's execution, that's why in terms of A&A and fast-tracked projects, we can somehow do better because many of these projects require immediate decisions or quick thinking. So, for companies that have a lot of procedures, they may find difficulties in handling projects of such nature," noted Mr Teo Tiow Guan, who laughed as he quipped that this has made them busier. Today, Vigcon is certified by the BCA as an A2 general building contractor, which means that the firm can bid for government projects of up to S$85 million. The Teos hope to raise this to A1 next year, which will allow them to "tender unlimited contract value". But first, the Teos want to do some housekeeping. In the next one to two years, Vigcon will consolidate its business at a new one-stop facility hub comprising office, dorms, area for light production and fabrication, among others. In line with this, the siblings are looking to move into residential or industrial property development here or overseas in the next three years. While nothing is concrete, green energy and green products are some areas that the Teos are paying attention to as well. As for plans to get listed here, the brothers said that it would probably be five years down the road, barring market conditions. As much as they appear somewhat hopeful, the Teos remain cautiously pragmatic, choosing to focus on work - something they probably learnt from the younger Mr Teo's earlier years. After all, it had never crossed his mind that he would get this far.